Detail of Mural "The Inheritance of Struggle" (1993) by Leo Tanguma. Wisconsin Union. WELCOME TO THE CHICAN@/LATIN@ STUDIES PROGRAM AT THE UNIVERSITY OF WISCONSIN, MADISON! The Program in Chican@ and Latin@ Studies (CLS) offers a systematic and interdisciplinary analysis of Mexican- and Latin-American-origin people, cultures, and collectivities within the United States. The CLS certificate is designed to provide students with a broad knowledge base and the intellectual tools to understand the unity and diversity of U.S. Latina/o populations. The primary objective of the CLS Program is to train students in the study of Chican@ and Latin@s, as well as to introduce them to the central questions, topics, and applications that have emerged in this field of inquiry. CLS offers a variety of courses, some focusing on particular national-origin groups or specific academic disciplines, and others organized around comparative topics or issues. We welcome you to join our academic community of learners. Take a Chican@ & Latin@ Studies class this summer!! The CLS Program will offer a section of its introductory class for the May 28 – June 16 2019 summer session. The course is a great way to fulfill the University’s Ethnic Studies Requirement. 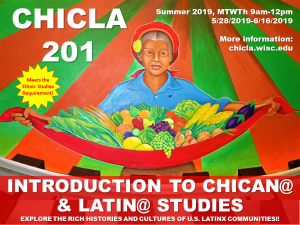 Other CHICLA classes available this summer include CHICLA 245 (“Chicana and Latina History”), which fulfills both the Ethnic Studies and Communication B requirements, and CHICLA 440 (“Ethnicity, Race & Justice”), which fulfills the Ethnic Studies Requirement and Social Science breadth requirements. Students can search for courses by term using the Schedule of Classes. More information is also available through from the Course Guide and the CLS Program’s course page. Feedback, questions or accessibility issues: pchaney@wisc.edu.